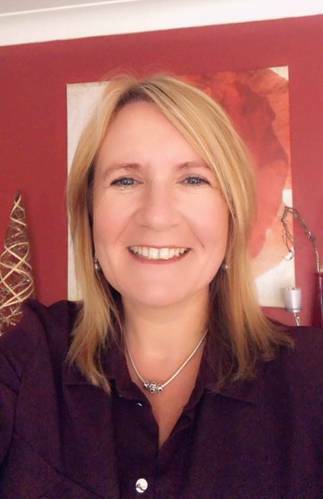 We are delighted to announce the arrival of Sue Kimber as our new Administrator at Bedfordshire Golf Club. She reports to Lynne Hopkins, our Office Manager and takes over from Mags Barbour. Having lived in Bromham for over 30 years, Sue is familiar with the club, but not the ‘golfing vocabulary’ as no family members play golf (yet)! Her career to date has been based around administration, secretarial, accounting and tutoring, so she should pick up the reigns in the office fairly quickly. She is married with 2 children and 2 dogs (seen here)! Her daughter Jess is just about to finish her Masters at Nottingham University in Mechanical Engineering and her son James is training locally to be an accountant. 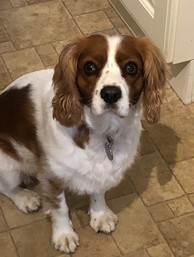 In her spare time she likes walking the dogs, home decorating and socializing. Sue says "...I'm really looking forward to working in the beautiful setting that is Bedfordshire Golf Club and getting to work in a team office environment again, rather than working from home". 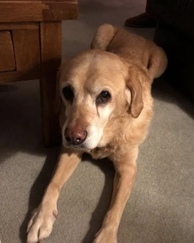 She hopes to meet as many of you as possible over the coming weeks, so pop in and say hello. After 9 years of dedicated and professional service, Head Chef Peter thinks it's time he put his feet up and he has decided that he will retire at the end of July. 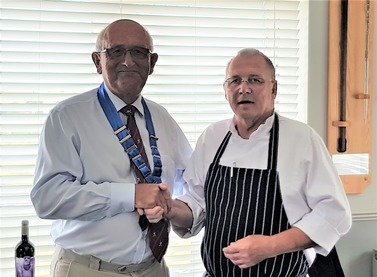 Peter has been a very loyal and steadfast member of the Club's senior management team, often operating in challenging circumstances and under his leadership our kitchen has served both members and guests/visitors with excellent and tasty fare. 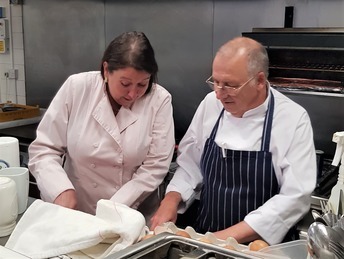 At the same time, we are pleased to announce that we have appointed a new Head Chef, Debbie Caves, to lead our catering team, working alongside Adrianna and our other kitchen staff - and to work closely with our administration and events teams. 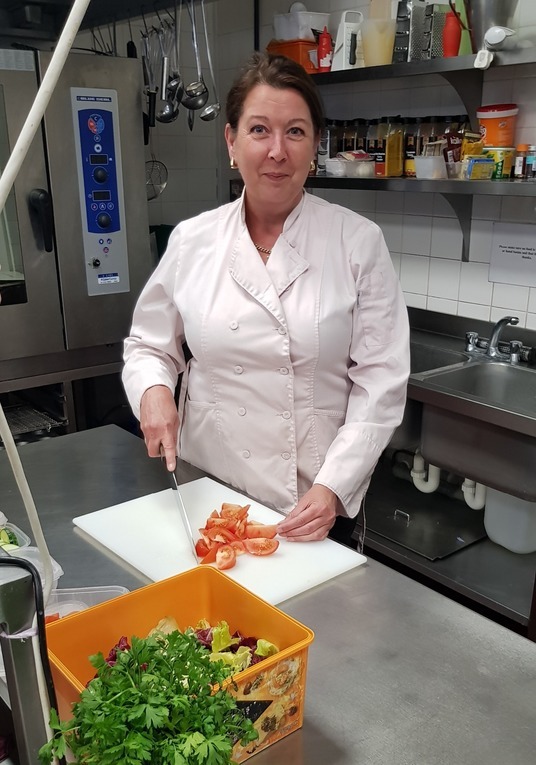 Debbie brings a wealth of relevant catering and hospitality experience and having helped us out in the past with some larger events, already has a pretty good working knowledge of our kitchens. Debbie joined us in mid-July for a brief handover period with Peter and will fully take over the reins to coincide with his retirement at the end of the month. During this period, they are sharing the responsibilities for delivering our range of catering services to both members and visitors. Please join us in wishing Peter a long and happy retirement and welcoming Debbie to the team. 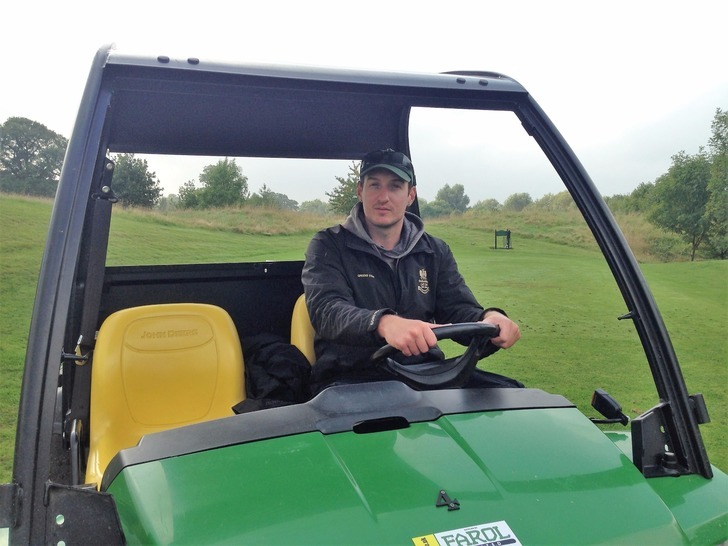 We're pleased to announce that Ricky Goodman has joined the Green-Keeping team here at Stagsden. Ricky is 34 and has been green-keeping since the age of 16. He started his career at Hadley Wood GC and then went on to Porters Park GC. This is where he started day-release to attend St Albans college in order to secure the various green-keeping qualifications he now holds. From this point he decided to spread his wings to gain wider experience and moved to The Colony Club in Austria where he worked as part of a team of 40 greenkeepers! 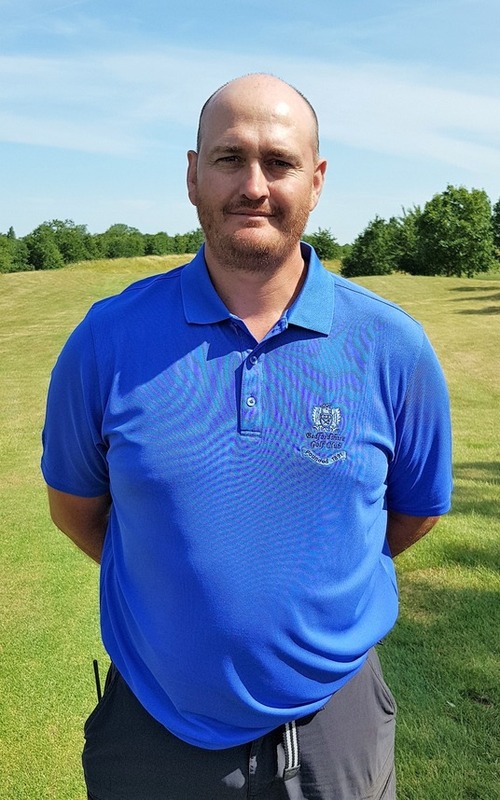 From this point he moved to The Netherlands in a First Assistant role, before moving back to the UK to become Deputy Course manager at Hendon Golf Club, under Bob McMillan - a member of the successful McMillan green-keeping family. Ricky commented, "I spent 10 happy years at Hendon, with 6 as Head Green-keeper and acquiring a wide range of skills and knowledge through training and development, including my Level 3"
Having moved with his family to the new Wixams Development south of Bedford in 2014 however, Ricky found the daily commute to Hendon too much and he moved job to become Course Manager at Wavendon Academy. As most of us will know, the land owners sold the land for development soon afterwards and as Ricky felt his future in jeopardy, he left to start his own business for while, awaiting a return to golf when the right opportunity came along. As Ricky commented, "The vacancy at Bedfordshire Golf Club was just the opportunity I had been waiting for. On meeting John and Dean for the first time, my whole motivation for golf was regenerated, and on being offered the job, I was in no doubt about accepting. The whole team has been so welcoming and I find the whole approach to everything very professional. Johns' sustainable approach and the awards that go with it is of great interest to me"
Ricky has now enrolled at Elmwood College to study for his HNC, which begins in September and he says that he is really looking forward to his new career at one of the best golf clubs in the region. Although Richard was born in South Africa (the accent still gives it away!) he's spent much of his life in England having moved to Milton Keynes at the age of 12. He started playing golf at the age of 16 at The Millbrook. Here, he also first met Geraint Dixon and subsequently worked with him in the Pro-Shop. While at Millbrook, he was very successful on the golf course, and was club champion there three times. Recognizing that he was a good golfer, he set his heart on playing on the Pro Tour. Aged 20 he moved back to his country of birth, South Africa, where he says "...I chased the dream of private jets, flash cars and seven star hotels - the life of a playing professional. I survived for seven years on the Sunshine Tour where reality was dinner of baked beans on toast, one car with four players and luggage and a room shared with eight!" Then realising he needed to actually earn some money, he started working in sales at a large golf retail shop, learning the trade in golf, gaining knowledge in production, repairs and fitment of golf clubs. He was soon put in charge of looking after many accounts all over Africa. He then had to make a choice of moving back to England with his wife to start a family, or to stay there and risk pulling up to a set of traffic lights and not know if he’d pull away unscathed - a pretty easy decision really! 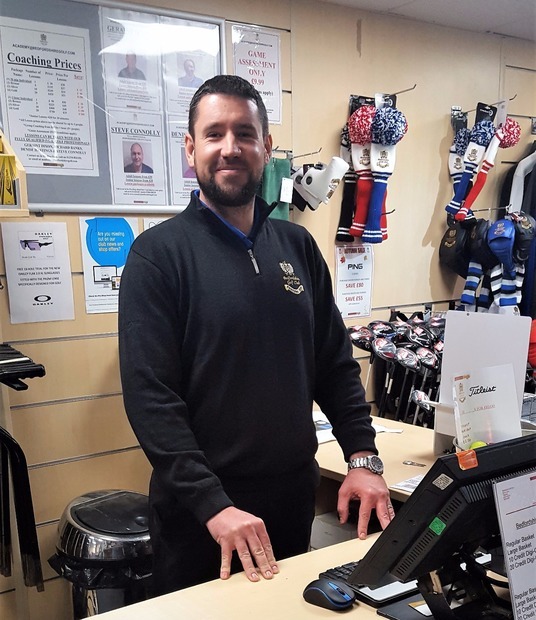 Richard subsequently re-joined Geraint - this time at Bedfordshire Golf Club, where has has worked in the Pro-Shop for the last 18 months. He commented.."Working at a true members club is great and it's definitely more rewarding, as you get to know people and their games and watch them improve over time. Of course, every day has it’s new set of challenges - but that’s just the weather!" If you didn't know anything about Richard before - you do now, so please take the opportunity to say hello when you're next in the Pro-Shop. 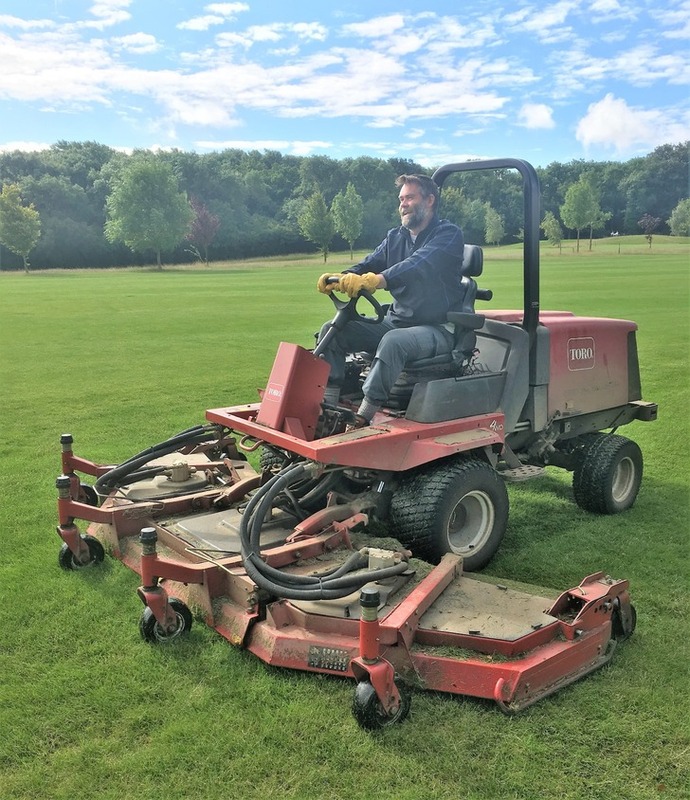 Dean started his green-keeping career at Luton Hoo hotel golf and spa, where he spent five and a half years working there as part of the team developing what was a relatively new course at the time. As part of his development he ensured that he received the right training and successfully achieved qualifications and certification along the way. He really enjoyed his time there but it was time to move onwards and upwards and soon he found himself with a head grounds job at the University of Hertfordshire which on paper was just the type of position he was looking for. After 2 years of looking after the university sports grounds he felt that the job wasn't really providing the job satisfaction he was looking for. Around this time he moved to the Bedfordshire area and started looking for a job closer to home. He was delighted when he saw a position come up at Bedfordshire Golf Club and applied immediately. Dean said, "Having done many years green keeping previously, I felt my experience could bring something new to the team. The courses here are in great condition and I'll do my best to keep them that way." Dean's been with us now for just over a week and he's really looking forward to meeting some of the members out on the course. Joe Bygraves, son of Club Treasurer, Gerald, is a published singer / songwriter who regularly plays solo gigs around the eastern region – and we’ll feature him again as he’s booked to serenade us at an event later in the year. The other, is Santino Cocchiarella (pictured here), with a name already designed for stardom, he played a leading role in the big 'Party in Bedford Park' last Saturday, where his band, The Wholls, more than ably supported lead act The Kaiser Chiefs in front of thousands of fans, and many members of the club! Santino joined The Wholls in 2015. 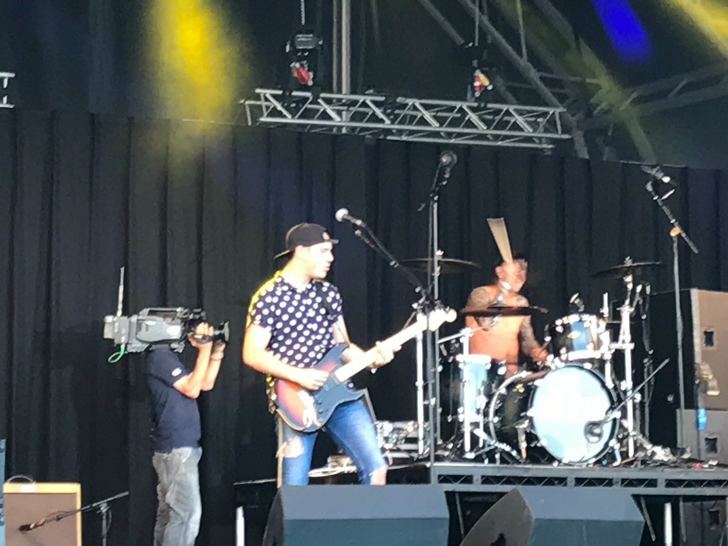 They performed at the Reading & Leeds festival for BBC Introducing and were signed to Sony music Germany. A European tour followed and their debut album is now available on Spotify and Apple Music. Santino said “It was great playing in front of our home crowd & we had loads of positive feedback from existing & new fans”. Normal service resumed on Sunday morning though, serving the Members after the Aquila Trophy & welcoming people at the new Members’ meet & greet! We wish both of them every success in their burgeoning careers – feel free to ask them about upcoming events & support them if you can! Some of you may have noticed a new (or for many, familiar) face, on the course over the last few weeks. Well Scott Matear has rejoined the greens team at Bedfordshire Golf Club after spending nearly 4 1/2 years at Rushden Golf club. Scott said, "I really enjoyed working at Bedfordshire Golf Club and was sad to leave in 2013, but I was offered an opportunity to take a more hands-on responsible role at Rushden which seemed like too good an opportunity to turn down. Whilst things started well, it unfortunately came with a lot of trials and tribulations and I recently decided it was time to move on. I was still in touch with the team at Stagsden and John Gubb let me know that there was a vacancy which had become available. The timing was perfect for both me and John as I have recently bought a house in Kempston, so from October I will be round the corner from Stagsden. I was offered a position back home here at Bedfordshire Golf Club and have thoroughly enjoyed my first month back with John and the team." When he worked at Bedfordshire the first time Scott completed his work based diploma level 3 sports turf, pesticide spraying pa1, pa2, pa6 and a lantra chainsaw course. Whilst he's been away, he's done more training and he's now looking forward to bringing some more experience with him to assist John, Dean and the team. Scott said, "I'm very impressed with how mature the courses have become over the last 5 years. The 18 hole in particular is a fantastic golf course and one that I will always be proud to be associated with. I have enjoyed seeing some familiar faces since I've been back and it really feels like home to me. I really appreciate how friendly and welcoming you have all been. I'm sure I will catch up with more of you in time please come over and say hi." 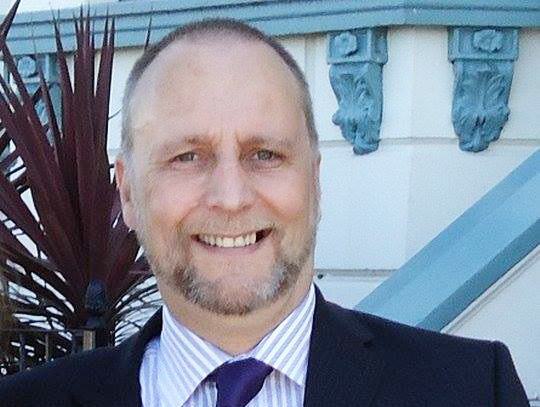 Introducing Steve Walters - our new 'Maintenance Man'! Members will be delighted to know that we Steve has recently joined us as our new (part time) Maintenance Man. At any facility like ours, there are always things which need to be repaired, maintained and improved and the current list of these is now being speedily addressed with by Steve. “I joined the Navy at age 16 and trained as a chef while travelling the world. Six-and-a-half years later and disappointed at the lack of promotion opportunities, I bought myself out and went into the road maintenance industry, driving a variety of vehicles such as compactors, diggers etc. for Wimpey during the building of the M25. At the end of that contract, I was happy to continue this interest in construction with Barnet Council’s Highways Department, maintaining the M1. All good things come to an end, however and when that contract ended he moved to Anglian Water and spent 10 years with them, training and working first as a plumber then as a re-instatement supervisor. Redundancy brought that chapter to an end and, deciding on self-employment as the way forward, he opened a small engineering workshop in Bedford, making bespoke motorcycle parts. At the same time, he was Crew Chief for Team Yamaha drag racing team which had a deal of success on the famous Podington Raceway. Steve commented, “It was the computer knowledge I gained from my involvement in the inception of fuel injection which eventually led me into building websites for other people in the back of the engineering shop. It wasn't long before that took priority and I sold the engineering business and moved into full-time website design and building. This, in its turn, morphed into computer repairs and I started Fixcomp in the early 2000s, then bought Amax Computers in 2013". Steve is now in the process of selling his company in order to go back to doing more of what he loves best – working with his hands. Hence the position here at the Bedfordshire Golf Club. 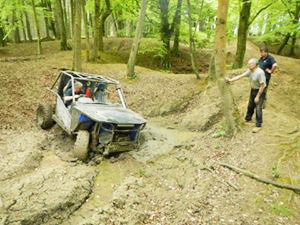 In his spare time Steve plans and organises off-road tours around Portugal for a wide variety of clients (www.portugaltours.co.uk). 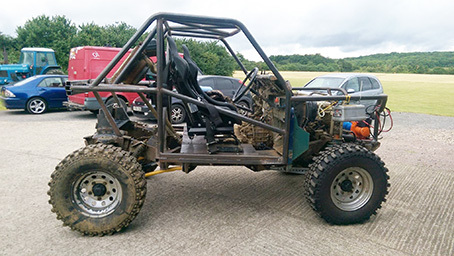 He also builds and operate 4x4 buggies, simply for the fun of getting thoroughly wet and muddy and the challenge of working out how to get from A to B. He said, “Another favourite activity is geocaching (www.geocaching.com), a sort of hi-tech treasure hunting which takes you out and about to all sorts of places, urban and rural, that you’d be unlikely to go to otherwise. He also enjoys the ancient ethnic art of flat-pack building when occasion demands, and is an avid collector of ‘boys toys’ - "my current favourite has to be my plasma cutter”.